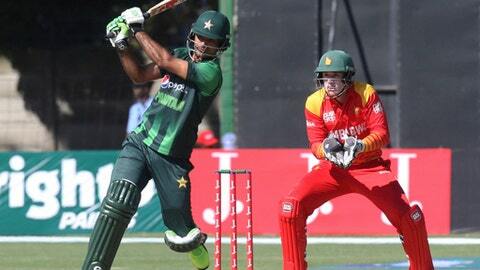 HARARE, Zimbabwe (AP) Top-ranked Pakistan got off to a flying start in the Twenty20 tri-series with a thumping 74-run win over depleted Zimbabwe on Sunday. Zimbabwe, going into the series without five top players because of a pay dispute with the country’s cricket board, was bowled out for 108 in 17.5 overs after Pakistan had made a strong 182-4. Opening batsman Fakhar Zaman (61) scored his second Twenty20 international century before Asif Ali blazed four sixes in his robust unbeaten 41 off 21 balls that advanced Pakistan’s total. Zimbabwe’s batting crumbled against Pakistan’s experienced spinners as Mohammad Hafeez (2-3), Mohammad Nawaz (2-11) and Shadab Khan (1-29) shared five wickets between them. Tarisai Musakanda top scored with 43 and was one of the three batsmen to reach double figures. ”The way Zaman, Asif, and Malik did the job for us … it looked like a good batting pitch,” Pakistan captain Sarfraz Ahmed said. Zimbabwe also suffered another blow when Kyle Jarvis couldn’t come out to bat after injuring his right hand during fielding. Jarvis tried to hold onto a difficult catch at long on that could have dismissed Zaman but ended up being taken to hospital for an X-ray examination for a suspected broken bone in his right thumb. ”The only bright point was winning the toss,” Zimbabwe’s captain Hamilton Masakadza said. Zimbabwe bowlers seemed to have controlled Pakistan’s strong batting lineup in the first half of the innings when the visitors scored 78-3 in 10 overs. But Zaman and Malik (37 not out) accelerated with a 44-run fourth-wicket stand before Asif’s clean hitting allowed Pakistan to score 62 runs off the last 32 balls. Zimbabwe, which is ranked No. 12, never got its chase going and lost wickets at regular intervals with only Musaknada showing some grit at the top. Solomon Mire, opening the batting, struggled in scoring 27 off 29 balls before falling to left-arm spinner Nawaz. The chase completely fell apart after Musaknada was caught at mid-off in the 17th over and Hafeez, bowling for the first time since his bowling action was cleared in May, grabbed the last two wickets off his five deliveries. Pakistan will take on Australia in the second match of the series on Monday.